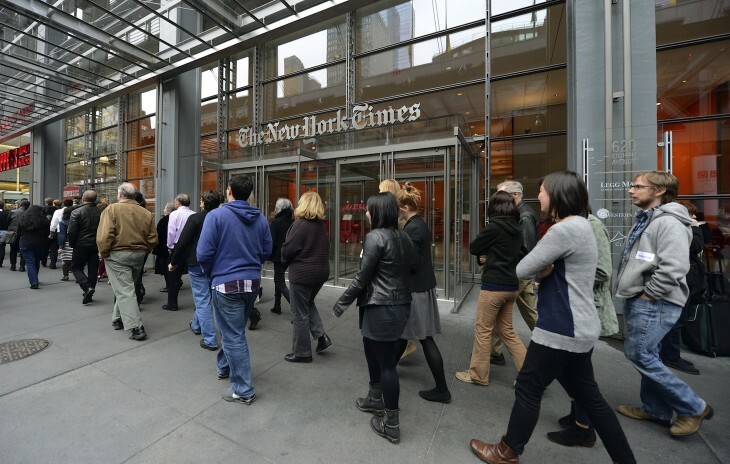 The New York Times Company today reported earnings for the fourth fiscal quarter of 2012, as well as the full year. The publisher’s total revenues increased 5.2 percent to $575.8 million from $547.4 million in Q4 2011, but advertising revenues decreased 3.1 percent year-over-year. More specifically, print advertising revenues decreased 5.6 percent while digital advertising revenues rose 5.1 percent. Circulation and ‘other’ revenues, meanwhile, increased 16.1 percent and 4.8 percent, respectively. The company reports that paid subscribers to the NYT and the International Herald Tribune digital subscription packages, e-readers and replica editions totaled approximately 640,000 as of the end of Q4 2012. The New York Times Company’s new CEO and president, Mark Thompson, in a statement says there’s now “approximately 668,000 paid digital subscriptions across the Company at quarter end, up 13 percent from the end of the third quarter”. FYI: its digital businesses include NYTimes.com, BostonGlobe.com and Boston.com. In Q4 2012, The New York Times Company’s digital advertising revenues increased 5.1 percent to $69 million from $65.7 million. For the full year of 2012, digital advertising revenues increased 0.2 percent to $214.8 million from $214.5 million in 2011. The company had operating profit of $44 million in Q4 2012 compared with $90.8 million in the same period of 2011. The New York Times Company ended 2012 with approximately $955 million in cash and short-term investments, even, as it notes, after making pension contributions and debt payments totaling about $188 million during the fourth quarter. In Q4 2012, the company’s cash and short-term investments improved by more than $340 million from Q3 2012 in large part due to proceeds from the sales of the About.com Group and its stake in Indeed.com.